An open invitation to come and see where the stitching magic happens! I'll be opening my home and studio for the very first Open House event this November. I've been in business for the past ten years selling my homewares, original textiles and gifts yet this is the first time I'll be opening the doors to visitors and I can't wait to welcome you! The open studio event takes place on Saturday 10th November from 11am – 4pm. I'll be doing a series of stitching demonstrations throughout the day, and refreshments will be provided. The event is also supporting Women’s Aid, with a portion of profits going to the charity. If you're creative and you'd like to learn how I create my textile designs, then why not join me for a workshop in 2019? Come and have a nosey round my custom-built studio where I teach a wide range of sewing workshops on a regular basis, and see what you could be making with your sewing machine. For those interested in purchasing gifts (and treats for yourself - why not!) it’s also the perfect opportunity to browse and buy from my new range of homewares, many with one-off discounts and special offers only available on the day. Although I'm stocked in lots of lovely shops and galleries across the country, this is the only time you'll be able to see the complete range in one place! The event is free, of course, but it would be great if I could have an idea of how many cakes to bake! Book your free place here. Come and learn how to make a fabric lantern too! Create your own design in fabric (no sewing involved!) or choose one of Jo's unique designs. See the lanterns page for more information and to book your place - pre-booking advisable. 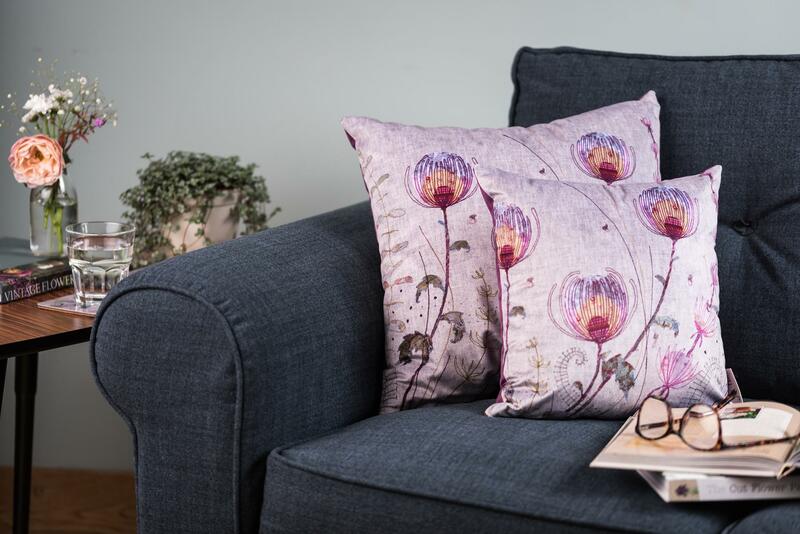 My new range of homewares was launched at Harrogate Buyers’ Festival this July, where I showed a range of unique designs, all inspired by British wildlife and manufactured in Britain. Irresistibly soft velvet cushions and lampshades are new for autumn 2018, as well as a unique collection of kitchenware, lanterns, cosmetic bags and mugs featuring my original designs. Since launching my homewares, I've always been determined to support British manufacturers. 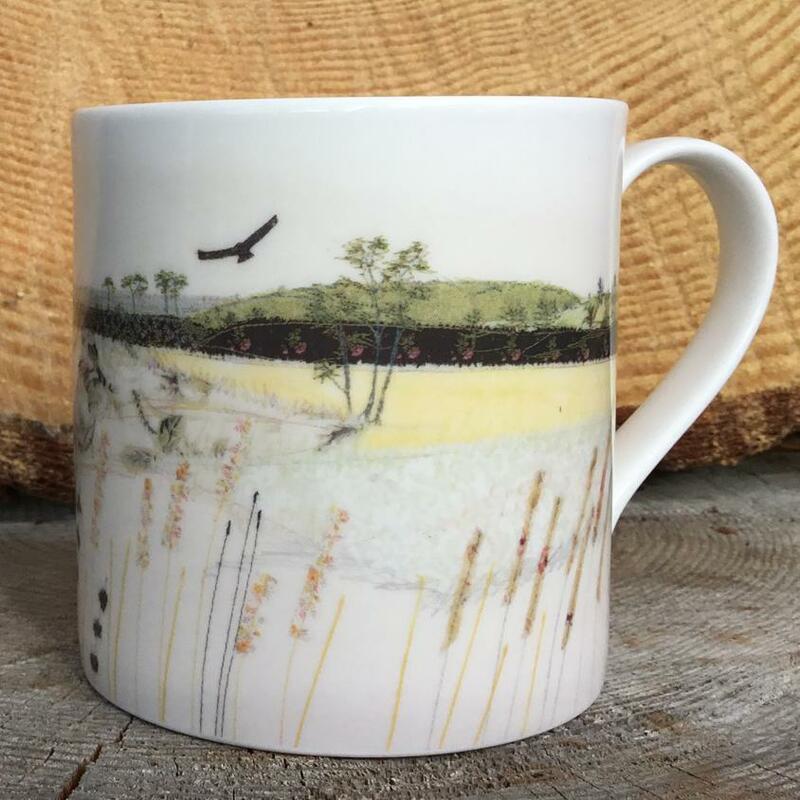 I'm proud to say that everything is made in the UK; the fabric is printed in Staffordshire, placemats, coasters and chopping boards are made in Peterborough, whilst the mugs are made from start to finish in Stoke-on-Trent of course! Pine Ridge, Whitgreave Lane, Whitgreave, Staffordshire, ST18 9SP. My house is the fourth on the right after the church (also on the right). Parking is available on the drive and at the farm opposite. 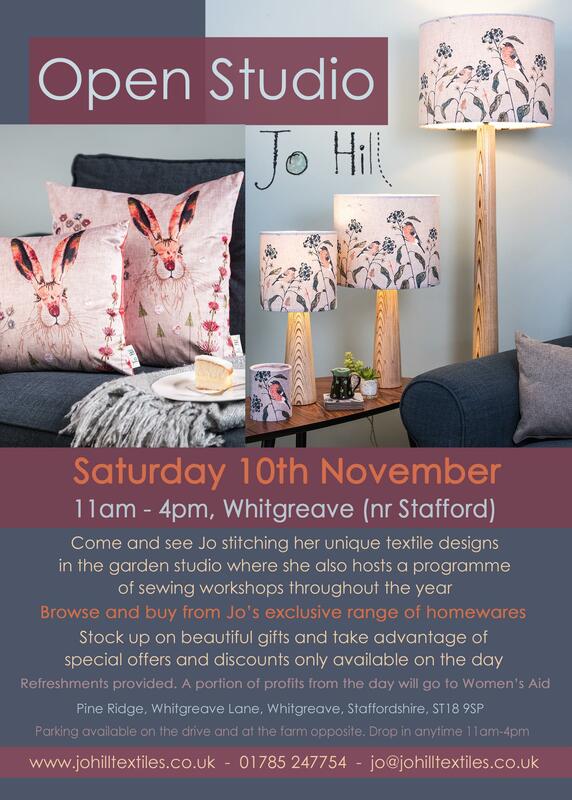 For more information, please email me at jo@johilltextiles.co.uk or telephone 01785 247754. Refreshments are provided free of charge - we would appreciate a donation to Women's Aid in return. I also have a card machine which accepts all major credit/debit cards. I look forward to welcoming you to the studio on Saturday 10th November!